They call him "Killa Cub" or "Beautiful Destruction" but the way Swanson gets overlooked is like a guy always getting friend zoned. Swanson (-115) has consistently been a top guy but lost to Max Holloway and Frankie Edgar and was all but forgotten until his Fight of the Year against Doo Ho Choi in Toronto. On the last fight of his contract, Swanson is on his way out and gets a chance to spoil the UFC's latest prospect: Brian Ortega. Ortega (-115) a.k.a. "T-City" is undefeated and the only blemish in his career was a "No Contest" following a positive test for drostanolone. He allegedly used it for weight cutting and his four straight third-round stoppage victories have more than proved he is a fighter whose abilities are the result of talent and not steroids. He's getting his biggest test against Swanson and a win here could vault him to a title shot. Five of Swanson's seven defeats came via submission and it took wearing him out to do it. Swanson is a surgical striker as evidenced by his 50.14 per cent striking accuracy. If he has a flaw, it's his tendency to overthink and instead of pressing the attack, sits on his heels to either counter-punch or land a perfect shot. This is why Holloway and Edgar gave him problems as the two moved a lot and constantly peppered him. Ortega is still developing his striking but can utilize footwork and movement to frustrate Swanson and tie him up. Ortega isn't just a Brazilian Jiu-Jitsu black belt but is under the renowned Gracie tutelage. However, he isn't known for his takedowns and even Swanson averages more takedown attempts. 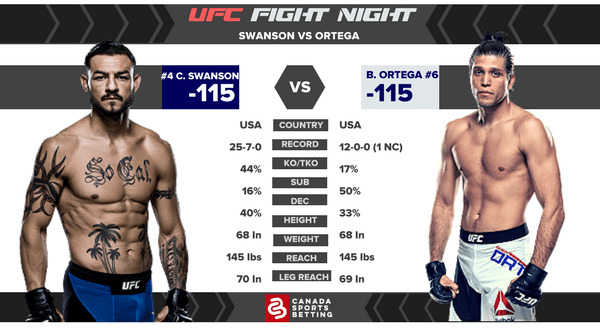 If Ortega can't find a way to use his BJJ on Swanson, he might be in for a painful night. The hype train steamed Ortega to pick'em odds. This either ends with Ortega submitting Swanson or Swanson outstriking Ortega to a decision. Bank on the latter to happen as Swanson keeps this fight on its feet and pieces up the young lion as he hands him his first defeat. Swanson will leave his mark on both the UFC and Ortega's face. -190: the line on Swanson the last time he lost when he opened as a favourite; he lost via third-round submission to now-featherweight champion Max Holloway. 6/0: the over/under for Swanson's last six bouts; he won his last four all by decision and lost two via a late finish. The last time an under cashed for Swanson was back in 2013 versus Dennis Siver. Lock it Up! The lock of the night goes to Alex Perez (-400); a hefty price tag for a relative newcomer but Perez is just a significantly better than the scrappy Carls John De Tomas (+280). Perez is a better striker and a better grappler and has a path to victory wherever the fight goes. Who's A Good Dog? Poor Alexis Davis (+155) always gets ignored and it's irresponsible she's this big of an underdog against a fighter she already beat, Liz Carmouche (-200). Davis recently became a mom and hasn't looked that motivated but even past her prime, she's already read the book on beating Carmouche. Just Say No: to Alejandro Perez (+175) vs Iuri Alcantara (-235); this is a fun exciting fight between two well-versed MMA fighters and one the higher-level Alcantara should win. However, Alcantara has a tendency to fight down to his competition and +175 is not enough for the outmatched Mexican. Pass! Canadian UFC/MMA fans should visit these sportsbooks and take advantage of their sign-up bonuses. These books offer so many ways to bet and depositing money is easy making it welcoming for new players who just want to to get in on the action immediately.